Mary Boleyn was a classic English rose, taking after her mother’s side of the family, whose innocence was wrecked by her father and sister. Not only was she used and abused by the French king, Francis I, and his cronies, she was pimped out to the English king and shown how to satisfy him by her sister, Anne. She was but a pawn in her family’s hands. After bearing the King two illegitimate children and losing her husband, William Carey to sweating sickness, Mary finally found true love only to be banished from court by her spiteful sister, who was now queen and married to Mary’s former love, Henry VIII. So cruel and ambitious was Mary’s sister that she even stole Mary’s son from her. Mary chose true love over ambition and was thus saved from the awful events of May 1536. Her forgiving nature and angelic disposition, however, led to her visiting the King and pleading for Anne’s life. Unfortunately, Anne was not pardoned and was executed, but Mary was able to steal Elizabeth from court and take her away from all the corruption there. It is a fairy tale and one that we all recognise as having glaring holes and blatant inaccuracies in it, but that’s the Mary that some people believe in. But what do we actually know about Anne Boleyn’s sister? Mary Boleyn came up in conversation on the night that Eric Ives was dining with our tour group in 2011. Ives commented that what we knew about Mary Boleyn “could be written on the back of a postcard with room to spare” and he is right. Despite the fact that two biographies have been written on her, she is the subject of countless online articles and the heroine of at least two novels, Mary is a puzzle. The biographies are full of theories about her and the facts are lacking, that’s just the way it is. What we think we know about her is probably based on fiction or theory, rather than hard fact. What we don’t know about her could fill a book, what we do know would fit on that postcard mentioned by Eric Ives. So, what are the cold hard facts about Mary Boleyn? Mary was born in the late 15th/early 16th century – We don’t even know her birthdate. She was the daughter of Thomas Boleyn and Elizabeth Howard, sister of Queen Anne Boleyn and niece of the Duke of Norfolk. She had brothers named George, Thomas and Henry. Mary had some kind of sexual relationship with Henry VIII on her return to England. It is not known how long it lasted. Mary was pregnant at least three times and had two surviving children: Catherine and Henry Carey. Her husband, William Carey, received various royal grants from the King, which are often used to support the idea that Henry VIII was compensating Carey for acting as father to his bastards. However, Carey was a royal favourite, a Gentleman of the Privy Chamber, and other members of the Privy Chamber, like Henry Norris, also received royal grants and offices. Her first husband, William Carey, died of sweating sickness on 22nd June 1528 and her sister, who was at that time involved with Henry VIII, was granted wardship of Henry Carey, Mary’s son, in July 1528.3 Mary was a widow and this agreement helped to provide her son with an education. Anne did not adopt or steal Mary’s son, she simply provided for him. Mary was at court at New Year 1532 and 1534 – “Mary Rocheford” gave Henry VIII a shirt with a blackwork collar and he gave her a piece of gilt plate in 15326 and her name appears on the lists of New Year’s gifts for 1534. The list for 1533 is missing. She married William Stafford in secret in 1534 and turned up at court pregnant in September 1534.9 This was when she was banished from court for marrying without Anne’s permission and her allowance was cut off by Thomas Boleyn. She was forced to write to Thomas Cromwell for financial help. Mary received her inheritance from her father and grandmother in 154313. We don’t know what she looked like, what her personality was like, who the father of her children was, the nature of her relationships with Francis I and Henry VIII (and even if she slept with Francis), her whereabouts at various times of her life, her relationship with her family… Mary is, in fact, the perfect blank canvas for an historical novelist. Her life and story, as we know it, is, in short, one big myth. For a discussion on the miniature above see The Faces of Thomas Boleyn and Mary Boleyn? Thank you to everyone who spread the word about my books being free on Kindle at the weekend. They were downloaded over 35,900 times! Jennie McGrath is the winner of the Amazon gift card and I will be emailing her. Alison Weir dates her death as the 19th July 1543, Josephine Wilkinson chooses the 30th July. Historian David Loades chooses to simply write “July 1543”. Alison Weir cites John Horace Round, the 19th century historian and genealogist, as her source for the 19th July date of death, and he does write in his 1886 The Early Life of Anne Boleyn: A Critical Essay “According to an inquisition taken at Mary’s death (19th July, 1543)…”, so it sounds like he based the date on her inquisition post mortem. Essex Record have a transcription of her Inquisition Post Mortem (D/DU 514/29/5, Fonds MANORIAL RECORDS OF FOULNESS) which gives her date of death as 19 July 1542, but this must be a typo as she was alive in May 1543. Catherine Carey served Elizabeth I as one of her ladies of the bechamber and the offices of Henry Carey, 1st Baron Hunsdon, included Privy councillor and Lord Chamberlain of the Household. Is there no history written on her husband that may give us more information? Also, is she truly the older sister of Anne or is thst a myth as well? Also, if she bore 2 children to king Henry wouldn’t that mess up the preconception of Henry’s supposed medical condition blocking him from fathering more then one child to the same woman? Last question…do we not know if the painting is of Mary? No, there is no history of Mary written, just two biographies which put forward the facts mentioned and theories as to the rest of her life. We do not know when she was born, just as we do not know when Anne was born, but it was near the turn of the 16th century c1499/1500. We also do not know who fathered her children so it cannot be used to back up any theory regarding Henry. And, no, we do not know if either of those paintings is an image of Mary. Alison Weir challenged the identity of the first portrait in her book on Mary, saying that the sitter must have been royal to wear ermine, but that is not necessarily true – see Susan Higginbotham’s article on this Mary Boleyn or Frances Brandon? The theory I have read that Mary was, indeed, the older sister, had something to do with a family inheritance which went to Mary’s son, Henry, rather than to Elizabeth, which suggested, if not confirmed, that Mary was the elder sister, since her son inherited the bequest, rather than Elizabeth, whose mother outranked Mary. I am sorry, I don’t remember the issue of the inheritance, or even what it was, or which historian put it forth as supposed proof that Mary was the elder sister. We know of two other Boleyn children, Thomas and Henry, who could have come between Anne and George, we just don’t know. Elizabeth Boleyn could also have suffered miscarriages or stillbirths too. My internet keeps going because our electricity keeps going off due to bad weather so “overwhelming” sums up today! D’Oh! Thank you Claire – too many senior moments for me of late! Mary us indeed mysterious, especially for the fact that for was related to the queen of England at one point. But then again, the whole Boleyn family is some what of a mystery. The portrait that is displayed is indeed, who we think is Mary Boleyn, but are not 100 percent. I relish in the ideas and myths, but I try not let them over whelm me, I prefer fact to fiction, but anything surrounding the Tudor period is a ton if fun. One question I would love debunked that’s simply driving me insane is the movie Anonymous. I was just introduced to it, and I had to pick my jaw up off the floor, I don’t really know what to say, or where to post thus. But Claire is fabulous and I had to ask, Claire? Baroness Von Reis? Anyone I have ever shared a blog about or anyone who I haven’t. Anyone please? I want to hear thoughts from anyone about this “two princes” theory. Not to be confused With the princes in the tower painting, but would be an interesting thought to that painting. Anyway, anyone help! What were the names of her other children? Not Henry or Catherine, but the others? Do we know that? On many sites I’ve seen 2 children listed for Mary and William Stafford: 1) Edward, b 1535, d 1545, and 2) Anne, b ca 1536. I’ve seen no proof of this or corresponding information, such as a spouse for Anne. I wonder if these 2 children were created in a novel or if they really existed. Maybe someone else knows more. It is true that we know next to nothing about Mary. Yet that hasn’t stopped historical novelists in the past using her as a foil for Anne, making comparisons between the sisters to Mary’s disadvantage, which, to me, is just as unfair as unfounded calumnies against Anne. Jean Plaidy was particularly guilty of this in her novel “Murder Most Royal”. Anne is described as beautiful while Mary is merely pretty. Anne is clever; Mary a fool and little more than a whore. It does appear that she married William Stafford for love, rather than let herself be used as a pawn by her ambitious family. Yet even this is portrayed by Plaidy and her ilk as a sign of Mary’s stupidity and lack of ambition. Let’s face it, she may have lacked drive and ambition, but she avoided the sticky end of her ‘cleverer’ siblings. All that being said; I cannot get irritated by novels, such as “The Other Boleyn Girl” , which give Mary “a bit of a break”. A blank canvas, indeed…but with fascinating possibilities for an historical novelist. She’s the Boleyn sister in the shadows of Henry VIII’s court, escaping Anne’s fall. How did she manage that? She must have loved obscurity after her sister’s fate. Claire, could this be your first novel? Mary, the enigma. Oh, wouldn’t I have loved to have been a flyon the wall with the two sisters in France…wonder what they would have talked about…thelatest fashions? the food? the king? I used to think it unkind that Anne took Henry Carey as a ward, but it was often the case when one had a wealthy powerful relative. It was considered a blessing for the child. Anne could do more for him than Mary could have done. I think they viewed it as an honor. THanks for a great article! Yes, the general consensus is that she was the eldest. No, I don’t believe that Thomas Boleyn ‘pimped’ out his daughters either, there is certainly no evidence of it. I’d be interested to know why you think that. 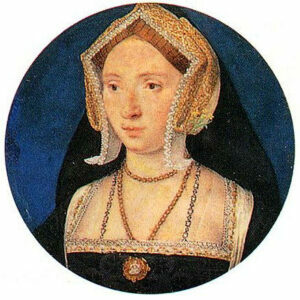 There is no evidence of Mary’s relationship with Henry VIII, apart from the dispensation applied for so that he could marry Anne and his comment “Not with the mother” when asked if he has slept with Mary and Elizabeth Boleyn, so there is no evidence at all that Thomas had anything to do with pushing Mary into Henry’s way. As for Anne, there is actually evidence that Thomas was against her relationship with the King – see https://www.theanneboleynfiles.com/18460/in-defence-of-thomas-boleyn-father-of-anne-boleyn/ under “Thomas the Pimp”. That article also shows just how favoured Thomas was way before either of his daughters were involved with the King. I think you should stop watching ‘The Tudors’ and go for something a bit more historically accurate. The gist of this thread about the Boleyn’s is that we just don’t know. The most frustrating thing is that we probably never will, though hope lies in the fact that nobody ever expected to find Richard III! ds370,Perhapes you are watching The Tudor’s to much? ?Back in the day you were lucky to get favors from the King. George was a paige to the King when he was very young,it’s called a job,yes Henry did hand out alot of favors to people at court,but once again ,Thomas Boleyn did not pimp his children out to the King.To be at the Kings court was a honor and to have titles was also a honor,all went out of there way to please Henry V111, better to make him happy, then to anger this King,also being poor then was nothing short of a nightmare,well I gess you would just have to be there to really know happen. Claire,Just one Qs, I thought that Anne was the younest child to the Boelyns?? It depends whether you believe in the 1501 or 1507 birthdate. I believe in the 1501 one so that would mean George was the youngest out of the surviving children, being born c.1503/4. If Anne was born 1507 then she’d be the youngest. You would have to ask yourself if Mary was 8 years older than Anne or only a couple of years. I’ll have to go back and check history as to when and to who Mary worked at King Francois’s court in France and when did Anne arrive? and other historical dates. First of all, let me just say I’m thrilled to have won the Amazon gift card! So, thank you, Claire. Not only for the card, but for the opportunity to let others know about your generous offering of them for free! Mary Boleyn has always been a particular interest of mine, so today’s post certainly caught my attention. I found it to be quite illuminating. Love the myth vs known facts format. I am wondering, though, if there are any books about Jane Boleyn. She’s another person I find interesting. I’ve read Philippa Gregory’s “The Boleyn Inheritance”, which I did enjoy, however I would like a little – or a lot – more information about Jane. Any suggestions? Jennie, there’s Julia Fox’s book on Jane Boleyn which is excellent. I read Julia Fox’s book about Jane Boleyn and even though it is a good book there are a lot inaccuracies in it. Also if it was supposed to historical fact not fiction then Ms. Fox would have left out all the statements about how Jane felt at certain points in her life as there is nothing that can actually tell us this. Claire, thanks for the rec. I’ll go find it now. Baroness, yep, I’m well aware that PG doesn’t begin to compare to Claire in the research department. I have enjoyed her Tudor books, but they always send me into a research frenzy. That’s why I asked Claire for suggestions. Great article. While Mary’s life being so unknown does make her a natural for historical fiction writers, I don’t know how they could get the idea that she took in the young Elizabeth. Isn’t there a letter from Elizabeth’s governess how she needed new clothes? I think it only happens in the movie version of TOBG, they go off together hand-in-hand, but, yes, Elizabeth was in the care of Lady Bryan. I’ve never heard of Elizabeth I naming Carey as her successor, where did you read that? He lived to a good age by Tudor standards, dying in 1596 at about 70 years of age. Mary has appeared in many, many novels (and is the lead in at least four), but her portrayals tend be pretty similar — the foolish but kindhearted sister who values love over rank and wins out in the end; the degrees of her foolishness and kindheartedness vary but that’s the basic template. (Interestingly, the first novel I’ve found in which she was explicitly the mistress of Francois I is from 1971 — since then, it’s become almost taken for granted that she was, even though the evidence for it is very thin). Making her a foil to Anne is hard for a fiction writer to resist, but I think there’s still room for a book in which she’s just as ambitious as her brother and sister, just doesn’t play her cards as well. At the end of the day, we dont know what actually went on, so its our imagination and the facts that we read that bring us to our own conclusions. Isnt this what it makes history interesting. I agree Sally-Ann. Our imagination is the way we’ll get to Mary and her contempories at this point. Maybe someday in the future, some long lost letter, or journal will turn up that gives us a new small glimpse into her life I, for one, hope that this happens! We don’t really know what Mary’s attitude to Henry was, as Claire’s very helpful summary of the known facts shows. She may have been madly in love with him or she may have disliked him and only succumbed to his advances because he was the King – who can tell? The truth may well be somewhere in between these two extremes. We don’t even know how long the affair lasted, it could have been anything from a ‘one night stand’ to a relationship over several years. However, the fact that Henry saw the need for the pre-emptive strike of the dispensation suggests that it lasted long enough for his opponents in the ‘Great Matter’ to have known about it and that he feared that they would use it against him. As to Mary’s appearance, I think that we can legitimately deduce that she wasn’t ugly and that she was probably good looking, although not necessarily a great beauty. Her character is likewise a matter for informed speculation -she seems to have lacked her sister’s forcefulness and steely determination, although her unconventional second marriage indicates that she was far from being a weak character. The lack of any genuine information about Mary Boleyn is almost as interesting and baffling as the information we DO have of her sister Anne. I like to read about Mary almost as much as I do about Anne Boleyn, because I imagine, with Mary, we can all put in our own theories and interpretations on her life. It is kind of sad that her life was almost the exact opposite of her famous sister. But, there-in, she did avoid being executed. There is noone left to tell us how she lived out the rest of her (short , I think she was only in her mid 40’s) life. That she was ignored and treated badly, or so history says, by her sister & her father, is indeed sad. Because I truly believe that growing up, the sisters were close. It is amazing what royalty can do to a person, I imagine, to where even your family does not matter, anymore. What a wonderful article!! It is truly a shame and quite sad that we don’t know where Mary is laid to rest. Of all the people during Tudor times, Mary is the one I am most curious about and most fustrated by the lack of facts! I can only hope that someday someone somewhere will find a long lost letter or document which will give us the informaiton we now lack about the one Boleyn sibling to escape the harsh punishments of Henry. If I’m not mistaken, didn’t Henry get Hever on Thomas’ death but sold it and gave at least part of the monies to Mary? I’ve often wondered if that money was his method of apology to her for killing her sister and brother or prehaps a reward for not causing any problems after the executions. I collect Tudor potraits; I download images into a file and use them as examples when I paint so I can accurately depict Tudor clothes. but the one that is said might be Mary is not in that file. I printed it on phtographic paper and my husband glued it on a block of wood. I did his magic and it now looks like a rather small portrait and sits on my dresser. whatever he did, it even looks like it has brush strokes and cracking from age. The wood block was the perfect choice since many potraits of that time were painted on wood. I look at her face and wonder is the soleful appearnace is because she knew so much heartache in her life at the deaths of her siblings. Which we’ll never know until more is discovered of her life. Karen Harper started writing historical mysteries (Elizabeth I mystery series) she wrote historical romances. One of the was about Mary Boleyn. It was called “Sweet Passion’s Pain.” I read it in jr. high, so I’m thinking 1981-1983 for a publishing date. There is definately one thing we do know about Mary, and that is she kept her head when all about her were losing theirs, physically and metaphorically speaking. She may have been a little reckless in marrying without permission, and it may seem a little tackless turning up a court pregnant, when Anne was wanting to get pregnant again after having Elizabeth plus having suffered a miscarriage, but if they were her worst sins, then she was practically saintly compared to many in those days. I think it was a bitter/sweet ending, and well deserved that Mary found some happiness and got to spend her last years married to someone she loved. It is also proper that her surviving children did well for themselves and found favour at court under Elizabeth too. Its sad she is always portrayed as being a ‘bimbo’, but at the end of the day she seems to be the one who had her head screwed on the right way, (excuse the pun), and survived the horrors that rained down on her family. That to me is not someone who is ‘thick’, far from it. I think it will be always ‘open game season’ where Mary is concerned when it comes to writing and the film industry because of the little that is know about her. But then again even if a trunk full too the brim of documents were found on Mary Boleyn tomorrow, I doubt it would make any significant difference to how she is perceive. We know such a lot more about Anne, and many other Tudor folk now than ever before, and still it has done little to bannish the myths that have built up a round them. @Julie, Harper’s novel you wrote about was reissued as “The Last Boleyn” in 2006. One other thing seldom mentioned about Mary: widows did traditionally enjoy the perogative of making their own choice of a second husband. This isn’t always obvious, and near relatives of kings were rather more discouraged from doing so, but still occasionally did. Examples: King John’s daughter Eleanor; King Edward I’s daughter Joan of Acre; Edward IV’s daughter Cicily of York; Henry VIII’s sister Mary Rose. The richer a widow, the more of a target she was, and her father or her family would undoubtedly PREFER to negotiate a second economically advantageous union for her, but I guess you could say that by that point she wasn’t her father’s chattel — that had ended when she was given in marriage the first time — and she wasn’t her husband’s chattel either, since he had died. Should have added that if you were close enough to the throne to possibly be a claimant, or to pass a likely claim to your descendants, the ruler would really want to approve any marriage for you, whether first or sixth, if it seemed possible to produce offspring. Still true in that the Queen has to approve the marriages of all descendants of George II — there are some caveats about descendants whose allegiance is to governments other than British, and for most individuals it’s very pro forma; the Queen announces to her council that it gives her great pleasure to approve the marriage of Very Remote Relative So-and-So and Proposed Spouse. I was wondering how did Mary escape Anne’s fall ? Did the king still have a soft spot for her ? I think it was a case of her being safely away from court and not involved. Weir wonders if she was even living in Calais with Stafford. Thomas Boleyn had titles before Anne became Queen – he was made Lord Rochford in 1525 and then the Earl of Wiltshire and Earl of Ormond in 1529, with George being made Viscount Rochford. Anne was created Marquis of Pembroke in 1532, so had her own title, and Elizabeth Boleyn was married to Thomas and so was the Countess of Wiltshire. Neither of Mary’s husbands were knighted so she did not have a title. Titles were usually inherited, as in the case of the Howards (Dukes of Norfolk) and Thomas Boleyn (Earl of Ormond), or given as rewards for loyalty and service to the King. Thomas Boleyn had served Henry VII loyally and had gone on to serve Henry VIII just as loyally, undertaking many diplomatic missions and services. George Boleyn inherited the Rochford title when his father was made Earl of Wiltshire. Thomas Howard’s father and grandfather had been Dukes of Norfolk so it was nothing to do with his ties to Anne, or being her uncle, that he had that title. His office of Lord High Steward followed on from a career which included him serving the King in many military campaigns, including serving as Lord Admiral at the Battle of Flodden, and holding offices including Lord Lieutenant of Ireland and Lord Treasurer. What you have to remember is that Mary was a woman and it was not the norm for women to be given titles in their own right, they gained them by marriage. William Carey was a gentleman of the privy chamber and was rewarded with grants, which Mary, as his wife, would have enjoyed the benefits of, but he died in 1528. He was not from a noble family so there was no title to inherit but his career seemed to be on the rise in the 1520s so he may well have been rewarded with a knighthood or title if he had not died then. Mary’s second husband, William Stafford, was a soldier and landowner, so not an important man, although I believe that he was knighted later in Henry VIII’s reign. So, there is nothing unusual in Mary not having a title of her own. I always understood Mary to be the eldest daughter tbh and if her childrean Katherine and Henry were Henry VIII going by the his son by Bessie Blount he more then likely would have regonised if not Katherine then Henry. As for Anne taking Henry Carey by force not so at the time wardships were not only an honour for many families but for those who had them it was a money making enterprise as seen by Thomas Seymour and the Duke of Suffolk. Lets face one or two facts here, firstly Mary had seen her brother and sister both murdered by the king along with 6 others on trumped up charges, secondly she wasn’t as stupid as some authors would have us think, I for one would have done just the same as she did and fade into the background………..who would want to draw attention to themselves after that and from Henry?! She didn’t have a death wish and good on her! Going back to her two older childean I am of the thought that her first husband was actually the father, as for the fact her son Henry had similar colouring to the King who’s to say Mary herself wasn’t of the same or similar colouring? At that time most notable families were in some way blood related to the Tudors. As for Ms Gregory as much as I enjoy her books I fail to take them as gospel, if anything it spurs me on to research more, the most laughable scene in TOBG and the film of the same name is when Mary goes to get Elizabeth to bring her up………..HELLO I found myself shouting out as I watched the movie……….LIKE THAT REALLY HAPPENED!!!! As it there are very scant mentions of Mary which makes it all the harder to find out any real infomantion about her and what we do have is not IMHO very reliable. Where? I think you must have misread something or perhaps someone else made a comment or a forum post. Very odd. That’s ok. Leanda’s article is excellent. I just need to ask something here, does anyone know? it is something that sprang to mind after reading tracy’s comment on who she think’s fathered Mary’s first 2 children, and this question is relating to all monarchs who had mistresses really; If a Lady was the mistress of the King, did she have to refrain from sleeping with her husband, until the affair run it’s course??? I am sure I have heard on some historical documentary, or read something in the past, that this was the ‘done’ thing. And any children fathered, if not recognised by the monarch would be taken on by the husband, and compensated accordingly….I am really curious about this. I think it would be quite interesting to see a novel that explored the thought that MARY was the super beautiful one (two husbands and the eye of the King) and super smart and an instigator of everything that happened to the family. Maybe she did get the eye of the king but realized that would lead nowhere since he was married and maybe she initiated the idea he move on to Anne and maybe she pushed the idea of being able to push Catherine out so she could be Queen (and support the family)and maybe when everything hit the fan she arranged things behind the scenes so she could escape the wrath of Henry and still get paid and get to keep her kids and head etc. I’m not saying, at all, that’s what happened. I just think one could have a lot of fun with the idea BECAUSE we don’t know much about her. What if she was exceptionally cunning and wanted it that way? It could be super fun to explore. Hi, My GM was a Carey from Guernsey but no direct connection with the Careys from UK. One of my cousins claims that a Cousin Robert Hunsdon was her godfather. Can’t find the connection. Off to UK in Feb and try and find out more of the mystery. I for one will not believe that Mary’s children were Henry’s. She was with him for at least a few years and the minute she married William she falls pregnant and has two healthy children. I found this interesting reading because, based on research I have seen, I am a descendant of Mary’s daughter, Catherine. Mary Boleyn is my 14th g-grandmother. I have little doubt that Henry was the father of Mary’s children. William Carey was his third cousin, but the appearance of Catherine Carey’s daughters says it all. They closely resembled their cousin and probable cousin, Elizabeth Tudor. That resemblance did not come from the Boleyn side totally. The Red Hair seen on Elizabeth and the Knollys girls came from the Tudor as did Henry’s. Alison Weir does have a very good biography of Mary, but she does not think that Mary’s son Henry Carey was fathered by Henry VIII–the timing does not quite work. Also, according to his portraits, Henry Carey looks a great deal like William Carey and nothing like Henry VIII. But her daughter not only resembles Henry VIII but also very closely resembles Elizabeth I, and Elizabeth I bestowed more favors on her family than Henry Carey’s. Mary is an interesting figure who frequently gets lost in Tudor history. Nice post! I have read the article and comments with fascination. It is warming to see that for a woman so little is known there is much interest. 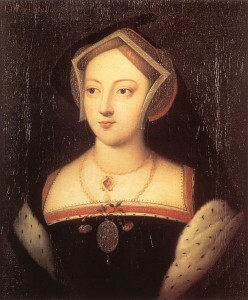 Mary Boleyn was my 12xgreatgrandmother. My American Immigrant ancestors were John West, who was Mary’s great grandson (Grandson of Catherine Carey Knollys, through her daughter Anne, Lady DeLaWarr), and his wife, Anne Percy (granddaughter of Lettice Knollys Deveroux Dudley Blount. Anne Knollys and Lettice were sisters. Thank you for your article and all of the comments. I would like people to just consider the possibility that perhaps Ann Boleyn May not have been the scheming seductress that history has made her out to be. Did Henry’s properganderists do such an excellent job of discrediting Ann, that unfounded suspicion has continued on until this very day? If Ann was the victim of the Kings affections, it’s entirely possible that she was a woman of high morals, who did not want to disgrace herself or her family by being a whore to the King and refusing him would take a certain amount of courage. Official documents may tell us otherwise, however did bias and malice find it’s way in that direction also? After failing to produce a son, the whispers of politics began against poor Ann, followed by innuendos and lies. She was a woman who upheld her values and yet was turned upon by those around her. I suspect that poor Ann has been given such a bad wrap and that history may owe her an apology. Here is what I have never understood, Elizabeth 1 was the queen of England wouldn’t then she have all that info on her mother and family ?? Was there not a family bible with birth and death dates?? Just seems people would have taken more of a interest in her mothers family?? That she herself would have ?? Great article Clare. I know Mary was banished in 1534. Do we know if she had any contact with Anne after that. Also is there any evidence that she could have attended Anne in the Tower after her trial? Claire you might find this of interest as to the finnal resting place of Mary Boleyn. This can be found in Ancestry UK and also yhe link at the bottom. Unfortunately, Ancestry UK is only as good as the information that users have loaded on it and findagrave.com is the same. We don’t know Mary Boleyn’s birth date, place of birth, place of death or where she was buried, we just don’t have the records. Her father and infant brother are buried at St Peter’s, Hever, but there’s no tomb for her. Some believe that she may have been buried at St Andrew’s Church, Rochford, Essex, because she inherited Rochford Hall shortly before her death, but again there’s no tomb or record of her being buried there. It’s a mystery.